Hey there. My name is Susan Crawshaw, and I’m the blogger behind Boxing Day. I grew up in the Midwest, the child of generations of teachers, farmers, and teachers of farming. Some of my earliest and fondest memories involve home-grown food, from tagging along with my grandfather to his tomato patch in the community garden (he joked I was “closer to the weeds”) to stalking the wild asparagus along the roadsides of Somonauk, Illinois (where my other grampa taught us that when bent gently, the spear “knows where to break”). For sure, that early proximity to truly fresh, truly local food has informed my choices as an adult. I still tend a garden at my home in Philadelphia, and to supplement what I grow, five years ago I signed onto my first Community Supported Agriculture (CSA) program. For an upfront investment each season, Lancaster Farm Fresh Co-Op provides me with a big box of organic produce every week. Sweet. But thanks to my awkward schedule (I work in a family-owned wine shop that specializes in sustainably farmed, estate-bottled wines), many days I don’t get home until close to 9:00 p.m., and that means preparing dinner, despite my best intentions, too often involves scrambling an egg or ordering a pie. I’m regularly horrified by how much produce I find that’s turned brown or blue or otherwise yucky at the bottom of my crisper drawer. 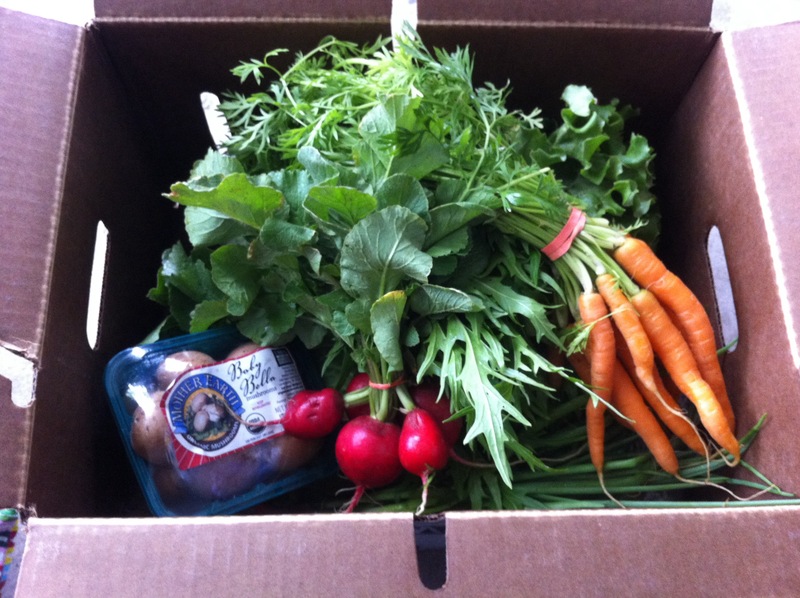 Boxing Day will document my season-long quest to make the most of my weekly CSA sharebox. I’ll highlight an ingredient or two each week, track how I use or preserve the contents, and try, in the process, to make myself more accountable for the food I bring into the house. In the spirit of Boxing Day—the giving, pay-it-forward spirit, not the frenetic, post-holiday-shopping spirit—I’ll share what I learn. If you have tips or questions for me, post a comment or send me an email. You can also find me on Twitter and Instagram. Here we go. Let’s eat ’em or or put ’em up. I look forward to seeing how you do. I’m especially interested in your 9 pm dinners. I also have a heavy work schedule and we eat far too late. I do manage to use most of my CSA box but alas, I am always looking for ways to eat earlier. Thanks, Tammy. I’m just getting started, but I’m looking forward to the season. Cheers. Very cool idea, Susan – will look forward to reading this! How do I give you your first virtual dollar so you can frame it? I like the layout! How fun is this!!! Looking forward to following your fun food ideas. I need new ideas, so thanks ahead of time. I am envious of your early growing season. We just got done shoveling! We can’t wait to read about your CSA experience, Susan! Keep us updated, thanks so much for your support! A great idea Suze! I’m looking forward to following along.